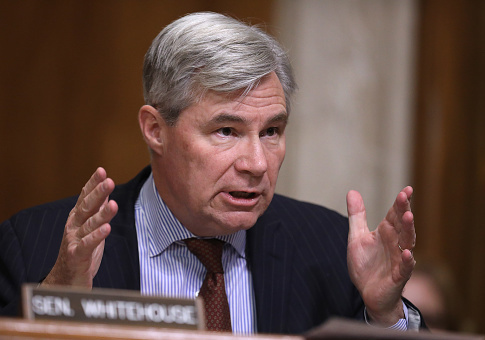 Sen. Sheldon Whitehouse (D., R.I.), a frequent critic of "dark money" influencing Congress, has connections to Gara LaMarche, the president of Democracy Alliance, a secretive group which helps coordinate funding between left-wing donors and Democratic Congress members. LaMarche is also the chair of the New Press, who published Whitehouse's 2017 book Captured: The Corporate Infiltration of American Democracy. Whitehouse and LaMarche toured the book together after its publication. "I think if Thomas Jefferson and James Madison came back here now and looked around they'd be stunned at a lot of different aspects of our lives," Whitehouse told LaMarche in one of the book talks, according to a report in the Westerly Sun. "But I think one thing that would really astound them would be the fact that corporations have such a big role in our democracy." In March 2019, Whitehouse delivered a speech on the Senate floor criticizing the Federalist Society for aiding President Donald Trump in selecting nominees for the Supreme Court. On Thursday, he delivered a similar speech, this time criticizing energy companies for influencing legislators to oppose bills addressing climate change, specifically the Green New Deal. "If you kicked out that support, the opposition would fall," Whitehouse said of "dark money" from energy companies, according to the AP. Whitehouse often delivers speeches criticizing congressmen for allowing special interest groups to influence their policy views. Democracy Alliance raised $300 million from Democratic donors earlier this month to support the Green New Deal and other climate change bills, a confidential document obtained by the Washington Free Beacon shows. Democracy Alliance has invested $1.83 billion in progressive causes since its founding in 2005. Its influence has spread over more than 150 left-wing organizations, including the Center for American Progress, Media Matters for America, and Citizens for Responsibility and Ethics in Washington (CREW). It has also helped fund the anti-Trump cottage industry, aiding groups such as the Center for Popular Democracy, Center for Community Change, and Swing Left. This entry was posted in Politics and tagged Democracy Alliance, Democratic Donors, Sheldon Whitehouse. Bookmark the permalink.